Who was born with the ability to read and write, and the ability to do the extraordinary – who was born smart? No one is actually born smart; we all started at point zero – from crawling, learning to talk, learning simple arithmetic, algebra, and communication, to our role today in the society as professionals in our different endeavours. But some people add some extra challenging efforts to advance what they’ve learned already, whilst others depend on and stick to only what they have learned, whether or not it gives them success or makes them smart. Dr. Carol Dweck of Stanford University, California, a Researcher of human mindset for decades, has found that, most individuals are either of fixed-mindset or growth-mindset. The former focuses on the belief of only one’s innate resources - here, it is erroneously believed that one is either smart or not; thus, smartness is genetic. The latter, on the other hand, centres on developing the brain capacity and “talents” by facing challenges and difficult tasks. Thus, “capability and intelligence can be grown through effort, struggle, and failure”. Truthfully and as has been confirmed by neurological Researchers, the brain really works like the muscle. The more you use it, the more it develops and the more difficult tasks you use it to resolve, the more extraordinarily better it becomes. This simply presupposes that failures only advance your intelligence, but always getting a thumb-up in the same activity, which you often do, only limits your mental horizon. Applicably, the best way to survive in a complex society is to erase the fixed-mindset syndrome and get clothed with the growth-mindset approach. Students should not totally constrain themselves to class activities or to their fields of study. In the opposite direction, non-students should not also consider education a thing for “the privileged few” and therefore limit themselves to their own activities. Going beyond our capacity is the key to a better, meaningful future. What people call intelligence or smartness obviously boils down to curiosity. How curious are you about some facts and skills? How curious are you about what you ought to have that you do not have? And how do you resolve them? You can’t resolve them if you are fixed-minded. You can’t resolve them if you allow the first few failures to tune you down. And you can’t resolve them if you sleep on your strengths or allow minor circumstances to defeat you. So, stand out, speak out, take a tedious task, and take a special education on your brain. No tests and no exams. In fact, the more failures you have, the better you become. You can’t learn everything in school. It is the extra efforts you take in training yourself that truly helps to make you very outstanding in life. No one is actually born smart – we all started at point zero. No one is smarter than you are and there is not a person, who can exactly do what you can do. Get more failures, get a better future! If you have read this post to this extent, congratulations! You have a growth-mindset and the sky shall be your first step of success. I really am surprised and I am very excited, too, that we are gradually advancing to the e-learning system. 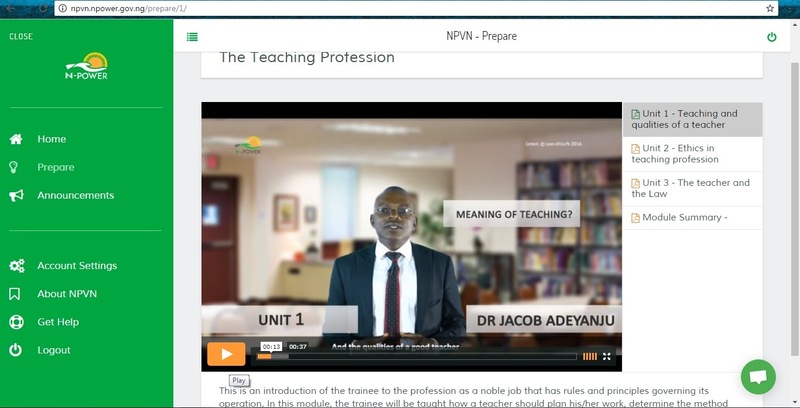 The ongoing N-Power e-lecture is akin to Coursera and Edx standards, which are global and educationally rewarding. This is a strong piece of evidence that our future is very brighter than our eyes can behold. Please, keep it up, Nigeria! Congratulations to all of the successful N-Power candidates and good luck to those who are still expecting their names to be shortlisted. But, if you never applied, let us ultimately hope for another good opportunity. To the successful candidates, this will not only benefit you financially, but also, most basically, the electronic experience will positively challenge your academic excellence and gloss your quest to expounding your specific academic horizon. It is, hence, hoped that within a reasonable while, our educational system will start recognising and valuing the certificates and skills obtained from free and affordable e-schools around the world. These schools are all available on the internet with unique learning, assessment, and certification processes. Doing this accordingly will enable Nigerians of all classes to pursue quality education amidst any financial epilepsy. Seven years ago, I had two friends (Ade and Kingsley) who loved and cared for each other very much. Every time they were not together, each of them somewhat lacked comfort and satisfaction - they always shared the little they had and they helped each other academically. In short, they were like close brothers from a mother. But one day, the unusual happened in the school. Ade was accused of stealing from a Teacher's pulse. He was severely punished and disgraced publicly after it was found to be true following his own confession. As a result of this incidence, many of his friends deserted him, made mockery of him, and even spat on his face severally. He would always be used as a reference point in every class, most especially the CRS classes. I could see him being very abashed and distressed - I was very sorry for him, honestly. In spite of what happened, Kingsley never judged him with feeble senses. Although he had a thousand and one reasons to do so and even to put Ade in the same category everyone had already put him, he still never gave up on the friendship and good relationship they had. He stood by his side firmly, corrected him where necessary, and instilled confidence and strength in him even beyond his own expectations. This made Ade to change totally and eventually became one of the best students at the end of the session all to the surprise of everybody. Truly, that's how it really works. When someone loves you, there always is one strong reason that they cannot give up on you. Even if there are many reasons to detest you, his heart still accepts you and will always do. It is this way simply because, when someone is really in your heart, you will not want him to be hurt in any form at all. You'll even want to be hurt instead of him. And this feeling of being loved puts hot fires in the bones to do what's good and what's right at all times. So, you could imagine how lovely the world would be if we had this kind of love and concern for everyone. A world where I'd love you very much even without proximity; a world where men would be helpers unto themselves; a world where we would not judge anyone so easily; a world where minor mistakes would not crumble relationships. There'd be no need to hurt and suppress others, there'd be no need for selfishness and envy, and the happiness of one would be the happiness of all. I know really well that this is very difficult and may not even be achievable considering the reality and structure of the world. We love and hate, secure and destroy, get happy and later become sad, cuddle and scold, understand and judge. Indeed, this is the reality in every society. But, I also know that it is not impossible - it is not impossible to show kindness and to be the source of people's happiness and success; it is very simple to love if truly our hearts and minds are open to all. This starts from you and me in the places where we live. It actually has to start from the inside of all of us so that the outside part of it can be well manifested to the glory of God. But we shouldn't really see it as a responsibility, but as a necessary part of what we have to do freely and wholeheartedly in order to better the persons next to us. Unnecessary competition and selfishness only increases poverty and suffering, but ultimately, love sends negativity to an eternal cemetery - it is the primary key to unlock the gate of sustainability and profound human ingenuity. Reaching the stage of Convocation Ceremony in any academic institution is not and will never be a piece of cake. It takes hard work, perseverance, and dedication to God to achieve the award of a Degree, a Diploma, etc. So many things are involved. There are lots of books and papers to read, many practicals to carry out, many excursions to embark on, many presentations to make, excessive academic writings, many exams to do, deep researches, etc. In most cases, you have to face difficult situations from thugs, associations, lecturers, friends, and family. There also are lots of regrets, life lessons, and love stories. Competitions, comparisons, and jealousy are also in on it (Chuckles). School is a wonderful world of its own! You will know no night and sleep will be far away from you. Some people will have to be fathers, mothers, and sponsors unto themselves. You will have to shun fun, friends, and hobbies, and marry books and lectures. You also will experience a mixture of happiness and sadness, stress and relief, etc. School is one of the tough places to be in; it’s a place where you spend so much in order to acquire knowledge, which will shape you in the society. One, who has completely gone through these, should be given a proper handshake of job opportunity. Today, another great number of creative and excellent technology graduates has been released by RSUST to the society. They are very fortunate to have successfully completed their study with whatever classes. It’s indeed a thing of merry celebration. 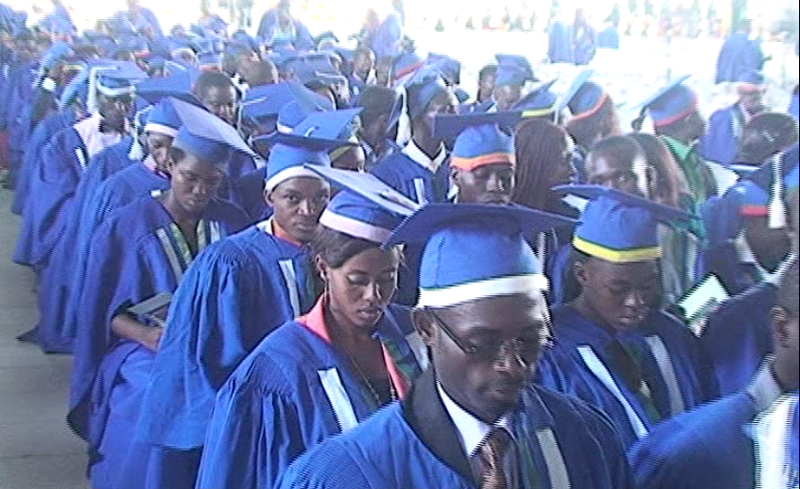 At this juncture, I hereby congratulate all latest graduates of RSUST and also, welcome them to the labour market. Good luck! We all wish for positive changes in our lives and in everything we do. Of course, this is quite amazing and very commendable because these changes make us better persons and help to remove us from the subsisting misery that seems to be the greatest adversary of our dear lives. Just as nothing good just comes through mere wishes, these have a cost. But, usually, some people are not ready to venture into this journey of fortune, rather, they prefer to get it in the quick and easy ways, and that is why real success seems to be far away from them. In life nothing is permanent; not even the happiest happiness or the saddest sadness. There always is an overlap. But the good news is that we have been given the capabilities of changing situations to whichever that we so desire; whether from good to bad or the reverse. This simply presupposes that we are the lords over the situations we find ourselves and not the other way round. I know really well that this might appear crazily ridiculous to many whose situations appear to be the worst, but it's the simple truth, which must be expressed unequivocally. And until we understand it as such, coping with difficult situations effectively certainly will be a hard nut to crack. So, changing bad situations to good, or good ones to better ones is never a piece of cake, there are structural preconditions. And this starts from the mind. The mind is the principal factor that shapes the change of circumstances. Most of the things we do are a product of the mind. So, where your mind often is of the negative, having positive transformation is impossible. It is indisputably asserted and believed that a change within fosters a change without; hence, intrinsic factors primarily influence external occurrences. It also is quite expedient and essential to understand the causes of the difficult scenarios that mop the sweat of happiness and good living away from us and the destructive repercussions or effects that ensue if they are not treated very appropriately. It is obviously clear that one cannot solve what he does not understand, and that constitutes a vital reason why comprehension is also paramount. Thus, whenever you have difficult issues, which seem uncommon to you, try to understand them. That way you have an idea on how to tackle it positively. Moreover, patience is a concrete element. Change comes gradually and serially, it does not come too sudden or too quickly. Most often, I see myself wanting a sudden end of the irksome situation I am into, it isn't wrong to feel that way, but it just does not help the situation. So, I do things that are expected of me and then employ patience and perseverance to get the real change, which I truly deserve at the material time. Do not be too hasty or let the circumstance awaken a drastic anger in you, because that will definitely increase the temperature. Anger does not solve anything right, it only causes more problematic problems. Above all, have confidence in the confidence of your belief. The manner in which most things happen establishes that there is a supernatural being whose actions are beyond our human comprehension. Believing in God and trusting Him, looking unto Him as the author and finisher of everything, will go a very long way to helping you to cope with tribulations and tragic situations alongside making you the very right person you really want to become. He never fails and He never neglect those who call upon Him in tough times. Whether you are a student, a businessperson, a teacher, a professional, no matter what you do and no matter what you are, there always is one thing that is dominant; tough times or changes. That posits that it is not strange to be confronted by it. However, it becomes strange and perilous if you use the wrong mechanisms to tackle it. Bad situations will rule you if you give it rooms and then make yourself a begging tenant. If you also have doubt in your faith, you will easily follow the dark side in your heart, ignoring the shining bright light, which leads to relief. No change will dig big holes in your heart if you really understand the causes and the reasons for you to determine it with well-principled blocks coupled with right mental construction.